The postman delivered a package Monday from EOS!----The black ponte knit fabric arrived and it is perfect with the black/brown fabric I ordered previously from EOS. I knew that it should as I had received swatches that I could match up with the fabric on hand and determined the right weight and black color. I am so excited to have this so I can start on this project over the long holiday weekend. 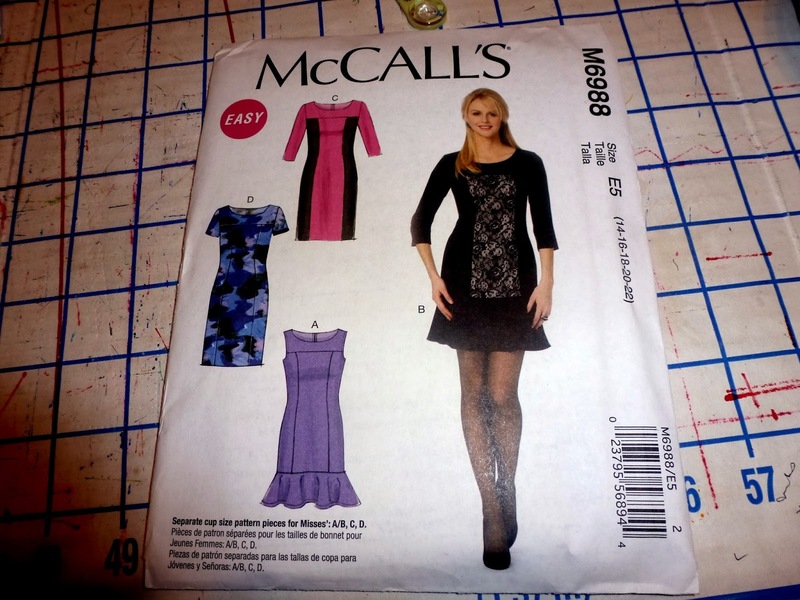 I washed and dried the black ponte from Mood to make another black dress using McCall's 6886. I made this previously using a scuba knit fabric from EOS. The fit is "perfected" so it should be an easy cut and sew project. I plan to make the scoop neck version with 3/4 sleeves. I am still debating on which dress to make for the class reunion event. I am still stuck on these two three patterns. 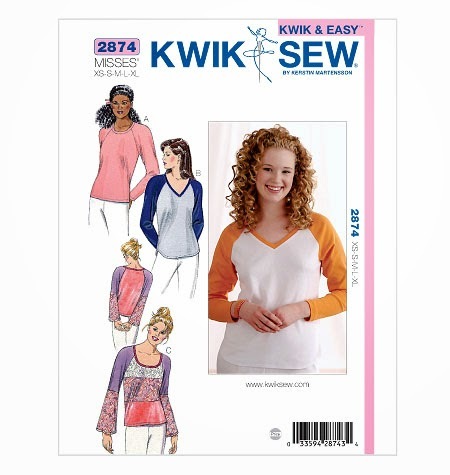 Today I tackled the Kwik Sew pattern for a raglan sleeve, high scooped neckline. Interestingly this is now an out of print pattern and I would say it's probably a replica of an older version of this top. I made View A accept I change the hemline and used View B's hemline. As usual Kwik Sew pattern was fairly true to size, perhaps I should say true to my expectations of size using KS patterns. I made my usual adjustments: sway back, 3/8 inch horizontal tuck in upper front and back bodice, shortened sleeve length by 2 inches and it was still too long so while cutting it out I reduced it another inch. The fit of this pattern was much better than my recent attempts using Burda, New Look, Kitschy Coo and Textile Studio. I probably should have just used this right off but it's nice to try other pattern sources; sometimes they work and sometimes they don't! Remember this post where I needed a black ponte knit that would go with a previous purchase of a black and brown ponte knit from EmmaOneSock. The purchase from Mood was a lighter weight fabric that would not work with the brown and black fabric; it was the right black just not enough thickness. I tried applying interfacing to a piece hoping that that would give it the right hand I needed. It did and yet it didn't. Following up with Linda at EmmaOneSock, she sent me 5 different samples and happily 2 of the 5 were perfect and I was able to order what I need. When that fabric arrives I will switch my focus to making my LBD. I still am trying to choose between two dress patterns. Meanwhile I will still focus on a raglan sleeve top. 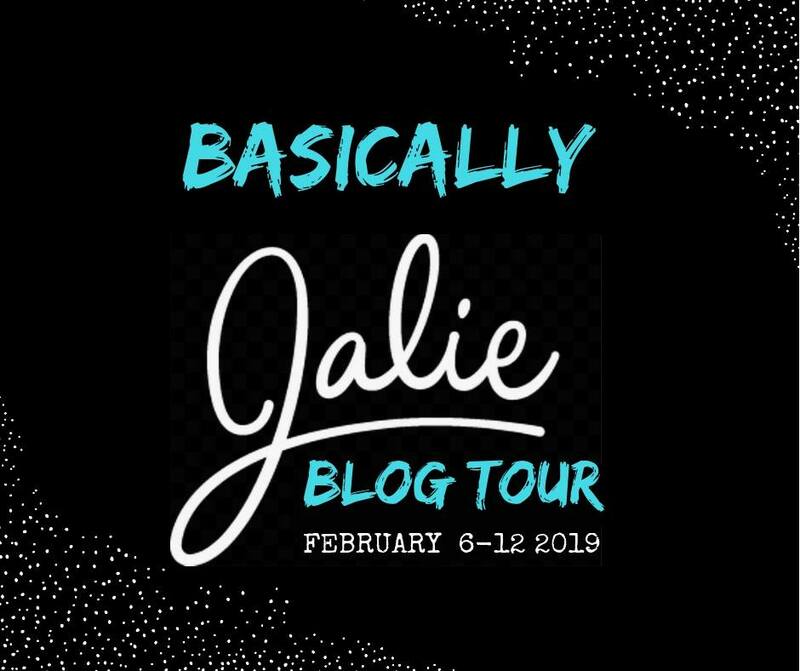 More updates to follow. Enjoy your sewing weekend. As I noted in my last post I am working on the Tribeca Top. My adjustments that I made with the 2nd top helped some yet I'm not happy with the outcome. Even though I'm using the high scoop neckline it is still low on me. The top also has a tendency to fall back and I'm not sure how I could fix that with raglan sleeves. Even with the adjustments in the back I still have fullness in the upper back right above the waist, not at the shoulders, and the hip adjustment now makes the back swing forward at the hemline. This is the fourth raglan sleeve top I have attempted. Perhaps this is not the right style for me. My issues are at the neckline for all of the tees I've tried and with my narrow back and hip fluff. I'm just not finding the right combination of fitting adjustments thus far. I normally do not sew a muslin. Most of the time I use a pin and fit method as described in the book "Fit for Real People". Perhaps instinct kicked in for this particular top and I decided to test the fit using similar knit fabric that I want to use when making the real garment. I am glad I decided to do that. I used a knit that has been in my stash for awhile and was left over from another project that did not go so well. I traced the sizes I used for the Penny Pinafore dress pattern. I then cut out the test knit fabric and quickly serged the top. There were a few fitting concerns. 1. The sleeves were too long for a cap sleeve on me; I failed to shorten the sleeve in the shoulder area. I pinned that out on the test garment and made the fit better. 2. I took a horizontal tuck in the upper chest and upper back to go with the shortened sleeve. Limited sewing took place this past week. There were more starts and stops with little bits completed. The black ponte knit from Mood fabrics was the perfect rich black color I wanted; the weight or hand of the fabric is somewhat softer/thinner. I don't think it will work with the black and brown fabric. 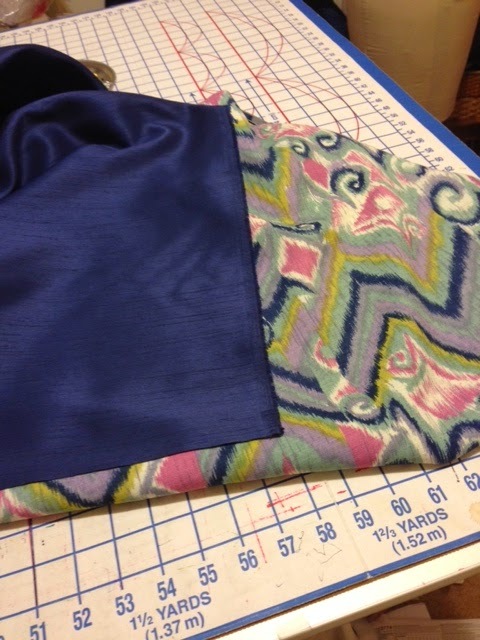 I am going to try to apply a knit interfacing to a square of the fabric to see if this may give it the hand I'm wanting. Meanwhile I completed the taping of numerous pattern pages for the Tribeca Top. 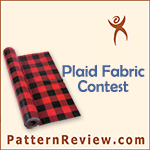 This is an independent pattern from Kitschy Coo. The Penny Pinafore dress pattern was a great fit particularly in the upper bust/chest area. I have now traced and cut out the pattern pieces for my size and will test this with another solid knit fabric from my stash. Hopefully this will fit as well as the other pattern did. I hope your sewing is going well and will post more later. Prior to my staycation I ordered some fabrics from EOS. I took photos using my iPhone and posted to Instagram. I thought I would showcase them in this post. I decided to wash the two knit fabrics yesterday to prepare for sewing later. I really need to stay off of EOS website, too much temptation and it is not like I don't have enough fabric already. I did order some black ponte knit from Mood yesterday. The black I have currently is not a rich black color and based on description on their website the fabric I ordered yesterday will hopefully go well with this fabric that I want to use in a dress. This fabric was purchased from EOS earlier this year. I washed it yesterday as well as I did not recall washing it previously. This with the black ponte will be used in a dress for my upcoming 45th high school class reunion. 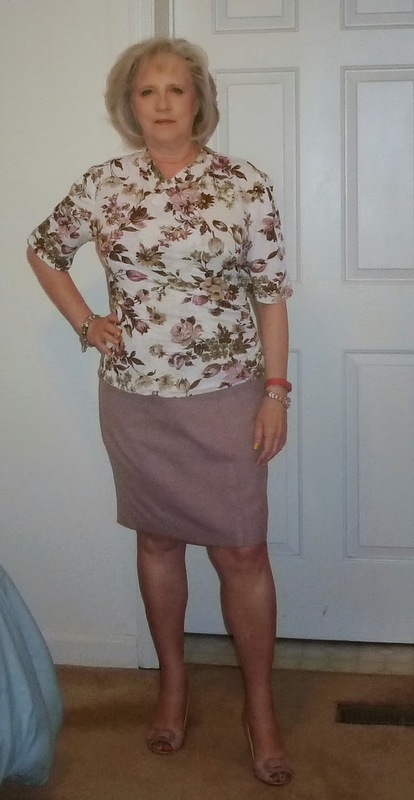 Last week I finally wore the New Look top and the McCall's skirt. Both fabrics came from Vogue Fabrics a few years ago. As you may recall I had enough of the boucle type fabric to make two skirts as my first version of another pattern had some issues. The knit top I made previously was a better quality knit than this knit top. This knit top fabric is a mesh type fabric; it continues to stretch as you wear at and does not seem to recover as well. The skirt fits well and wore well. I have made this skirt pattern several times. Here are a few photos of the skirt and top together. Returning to work this week after my staycation slowed down my sewing mojo. Last evening I sewed the Santa Monica T using knit fabric from my stash that was left over from another project. I chose to use the previously traced Santa Monica T pattern; when cutting I added extra 1/2 inch for side seam allowance. I serged the top using 3/8 seam allowance per pattern instructions. The bodice fit but the shoulder and arms were wonky. Obviously I need to retrace the pattern as there has definitely been body changes and sizes. In September there will be a high school reunion (my 45th reunion) and I need to focus on making a dress. I have two patterns in mind and God knows I have numerous dress patterns in my stash so I have some more options. My DH thinks I should wear a black dress and I have several black fabrics in my fabric collection'. Recently Kathy of Kathy Sew's celebrated her birthday by having a giveaway. I was a lucky winner. I won a sewing book called "BurdaStyle – Sewing Vintage Modern." I had the chance to look through the book yesterday evening and found it to be a very enjoyable sewing book. It has several garment patterns. It has nice illustrations, as well as photos of different garments, and it is spiral–bound making it easy to go through. There are several very cute patterns for tops, dresses and blouses. Thank you Kathy for the giveaway and really am glad I won this book! 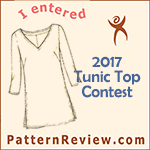 I mentioned in an earlier post that I was going to participate in the Pattern Review T-shirt contest. I pulled out from my pattern stash a raglan sleeve T-shirt pattern by Textile Studio called the Santa Monica T. It appeared that I had not used this pattern since 2004, or at least made notes to the pattern in 2004. I used a cotton knit fabric from my fabric stash and added 1 inch side seems as I am sure there have been some body changes since 2004. I now need to thread the serger and sewing machine. This will be pretty much all that I will complete for today. Next up firing up the grill for Sunday dinner. Monday is back to work day. Yesterday was supposed to be a nice sewing day. However the morning started off with computer issues. It ended up requiring me to call the GEEK SQUAD. This led to two hours of online work to the computer. All seem to be well, but then monitor blew. Visited the GEEK SQUAD at Best Buy. I now have a new monitor, that now goes with the new computer. It is a touchscreen monitor. I'm just happy everything is working again. It is amazing how much we have become dependent on computers. So today I installed Dragon Speak. That was the plan for yesterday morning. I'm now using it to dictate this post. Due to constant neck and shoulder issues I hope that this will help eliminate some of the problems I have when doing a lot of typing. I use Dragon speak at work and that's why I decided to try it for home. Of course at work the software was my employer's costs. This one is mine and I think it will be worth it. Now off to the sewing room with updates later. My staycation time is running out and as I said previously I have ambitious sewing plans when I am off but do not accomplish all that I set out to do. One skirt finished, one skirt UFO hemmed. Today I made fitting adjustments to Vogue 9004. I had to make FBA of 1.5 inches, some what of challenge with two separate front pieces. Usual FSA, swayback, horizontal tuck upper chest and back to raise the under arm area. I decided to use the navy blue fabric and not color block with the skirt fabric. This way I have more wearing options with the top with other skirts and pants. I am making the version with sleeves.